De retour d’Italie : une seconde série de "toy books"
While I was away in Italy, the publishers, who at first were by no means converted to the efforts we were making to get more artistic colour and treatment in these books, perceiving a growing demand for them, issued a set of my sixpenny books bound together, and called it "Walter Crane’s Picture Book", but without my knowledge. However, if they did not bring in much money, I had my fun out of them, as in designing I was in the habit of putting in all sorts of subsidiary detail that interested me, and often made them the vehicle for my ideas in furniture and decoration. 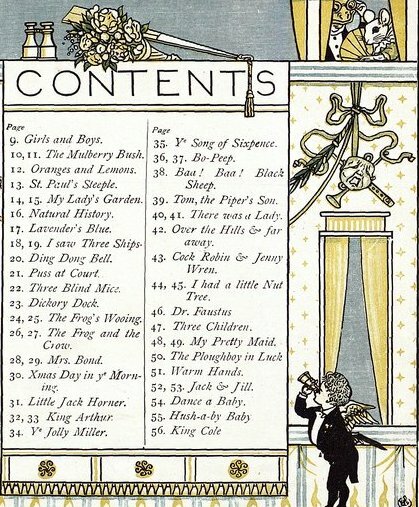 a new and larger series started, which included Aladdin, The Yellow Dwarf, Beauty and the Beast, Princess Belle-Etoile, Goody Two Shoes, and The Hind in the Wood. 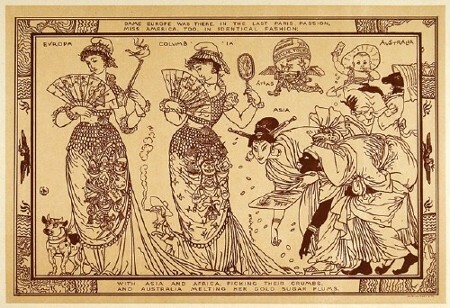 Aladin ou la lampe merveilleuse : illustrés par Albert Robida. 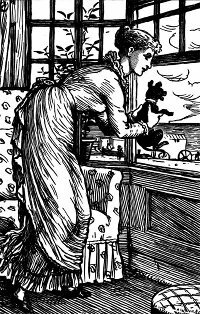 La Belle et la Bête : texte original de Jeanne Marie Leprince de Beaumont. 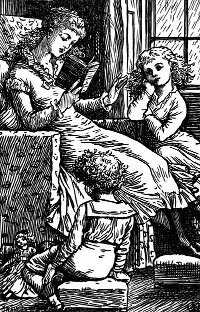 In 1874 was commenced the well-known series of children’s story-books by Mrs. Molesworth, issued by the house of Macmillan. The first was "Tell me a Story". I remember being introduced to Mrs. Molesworth in the late Mr. G. L. Craik’s office. 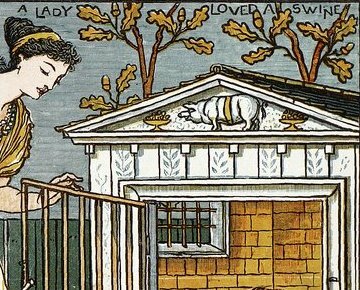 Mr. Craik then acted as reader to the firm, and he arranged with me to supply the illustrations to these very pretty stories, which I continued to do for many years. Speaking of wallpapers reminds me that it was in 1875 that I designed my first. 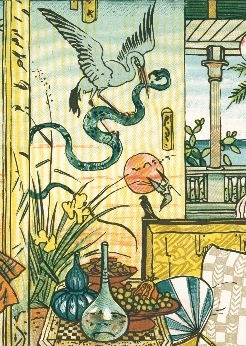 Mr Metford Warner, of the famous firm of Jeffrey and Co. (the same who printed all William Morris’s papers), called upon me and commissioned me to design a nursery wallpaper — no doubt in consequence of seeing my children’s books. 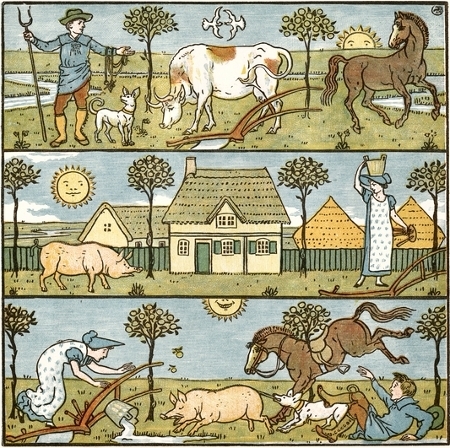 The design was in three columns divided by a narrow border, each column containing a group illustrative of a nursery rhyme, — Bo Peep and Boy Blue and The Queen of Hearts figured in it, — and it was for machine-printing, which necessitated the outlines of the faces being formed of brass wire (which was not particularly favourable to subtlety of expression), but one relied more upon the decorative effect of the general distribution and colour. 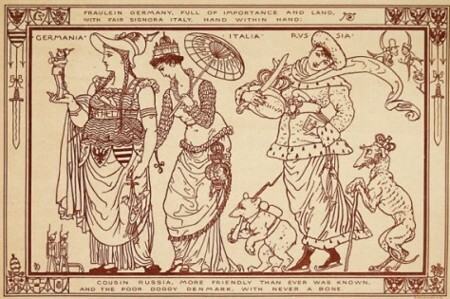 With this design however (the forerunner of many), a connection was established with the firm of Jeffrey and Co, which has continued up to the present time, a period of thirty years. I continued to paint in oil, and to offer at least one picture a year to the Royal Academy, but had met with nothing but rejection since 1872. The same fate (or shall we say distinction ?) attended a picture entitled Amor Vincit Omnia — a fanciful allegory rather in what might be called a Spenserian vein, showing an Amazonian city surrendering to General Love and his forces, with reminiscences of Rome and Florence in the background. The Dudley Gallery enabled me to show my water-colour work, and I continued to send there, eventually serving on the Committee. Le besoin d’un lieu d’exposition ouvert aux créateurs contemporains se fait pressant, et 1876 voit l’arrivée du projet de la Grosvenor Galery, dans Bond Street, en particulier pour les tableaux de Burne-Jones, Legros et Whistler. I had entitled the picture "Winter and Spring." It showed a ruined house of a Roman or Renascence character. 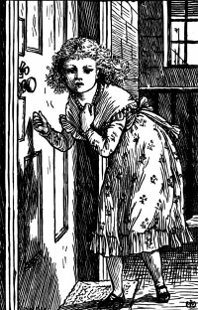 The figure of Spring in a light green robe was hanging a garland over the broken doorway, while crouched on the steps below sat another figure (Winter) wrapped in a grey mantle. Through the door in the atrium was seen a bronze figure of Time on a pedestal, with a sickle and an hour-glass, and through the ruined archway beyond the dark horizon of the sea. an attempt in quite a different mode and with quite a different aim from those children’s books. 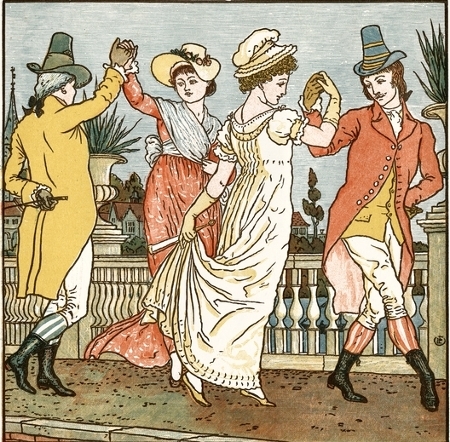 It was playful, fantastic, and allegorical, a medley of all sorts of characters and subjects, astronomical, political, social, with satirical or humorous allusions to current events and notabilities of the time. These mixed elements I endeavoured to combine in a series of designs in outline, and accompanied them with descriptive verses — the second title of the book being "Lines and outlines". 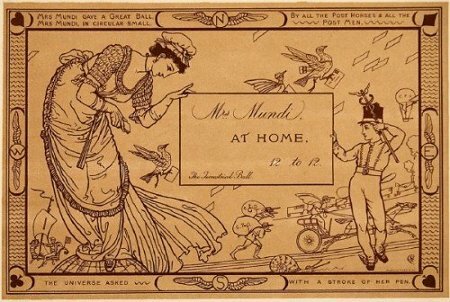 The book was published by the then existing firm of Marcus Ward and Co, for whom I had already designed other things, including a set of Christmas cards and a set of valentines. Dame Europe was there in the last Paris passion. Miss America too, in identical fashion. and Australia melting her gold sugar plums. and the poor doggy Denmark with never a bone. 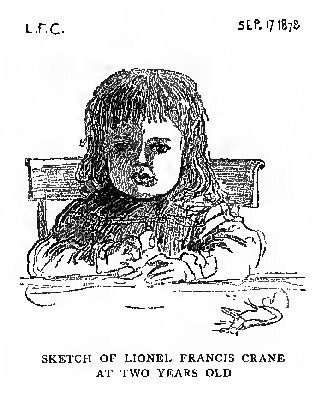 La fin des "toy books"
A l’exception du décès de sa mère à l’automne 1874, sa vie familiale et sociale s’entremèlent harmonieusement, une petite Catherine était née en Italie, suivie par Lionel en mai 1876. Il porte beaucoup d’attention à sa vie mondaine : ses relations avec l’aristocratie londonnienne ou provinciale lui procurent des commandes de portraits, de tableaux, de décors d’intérieur qui lui permettent de subvenir aux besoins de sa famille et de déménager dans un cadre mieux adapté à son travail (studio plus spacieux et mieux éclairé). 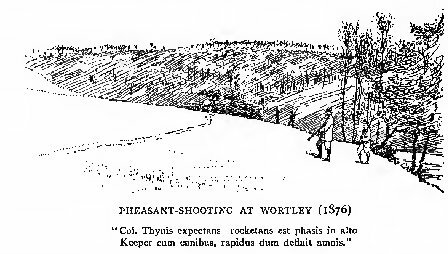 Shooting was the main pursuit, and was organised at Wortley on a considerable scale. One of the days there was a great drive through the woods, and an army of beaters was engaged, who seemed to do their horrid work very thoroughly, and as the line of guns advanced, steadily tramping through the underwood, they were kept busy by the cries of the keepers, "Rabbit back !" or "Hare forward !" as the poor frightened creatures sprang out of cover in desperate attempts to escape, but the sportsmen being good shots, gave them little chance. There are few sounds more heart-rending, than the scream of a wounded hare : then the rows of slain laid out in the stable-yard at the end of the day did not make one exactly in love with modern "sport". Ses relations avec ses collègues peintres lui procurent les échanges professionnels qui lui permettent de se positionner dans les mouvements artistiques contemporains. Les portraits qu’il fait de ses rencontres sont toujours aussi riches et savoureux, comme celui de Gustave Doré. 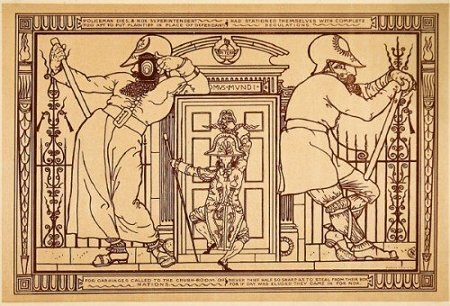 I remember meeting Gustave Doré, whose work as an illustrator of "Don Quixote" and of the Bible was then very much in evidence in England, and I think his Picture Galery in Bond Street was also started, and attracted the British public in considerable numbers. In appearance Doré was unmistakably French, but exceedingly quiet in manner and uncommuncative. He looked prosperous and inclined to be stout. He spoke in English, though I do not recall much more than monosyllables, and his smooth face and small moustache did not suggest the romantic and grotesque imagination which many of his designs, notably the earlier work, such as those to the "Contes drolatiques" undoubtedly possess. C’est l’époque où les artistes se regroupent, syndicalement pourrait-on dire, pour débattre de l’absence de "copyright" en art et en arts décoratifs et pour proposer de nouvelles mesures. In the midst of more ambitious work, however, I kept my book-work going. 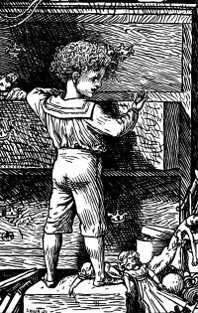 The series of children’s picture-books issued by Messrs. Routledge and Co. which had been added to year by year, had now come to an end with The Sleeping Beauty in the Wood. tapuscrit et traduction de "Orson and Valentine"
I had offered to continue them if granted a small royalty, but as the firm took the line rather of the provincial trader who said "We lose on every article we sell, it is only the quantity that makes it pay" there was nothing further to be hoped for in that direction, so I struck. Taking counsel with my friend the printer, Mr. Edmund Evans, we planned a book of another order, and The Baby’s Opera was the result. ... It was at Mr. Evans’s charming house at Witley, in Surrey, that the general idea and the size and bulk of the book were settled upon, Mr. Evans’s experience as a printer being most valuable in the practical details of cost and make up, and he supplied me with a dummy book, so that I was enabled to design the volume complete, with the pages in relation to each other and in strict accordance with the exigencies of the press and the cost of production. The Baby’s Opera turned out a great success, although at first "the Trade" shook his head, as the sight of a five-shilling book not decently bound in cloth and without any gold on it was an unheard-of thing, and weighing it in their hands and finding it wanting in mere avoirdupoids weight, some said "This will never do !" but it did. The first edition of 10,000 copies was soon exhausted and another was called for, and another, and another. It has long passed its fortieth thousand, and, like "Charley’s Aunt", is still running. Cet ouvrage contient la partition de trente-six comptines traditionnelles, le tiers avec une illustration couleur en pleine page. Le format, carré, en facilite l’utilisation au piano. L’humour et l’attention aux détails mobiliers, architecturaux ou paysagers de l’arrière-plan ajoutent un piment supplémentaire, comme toujours. 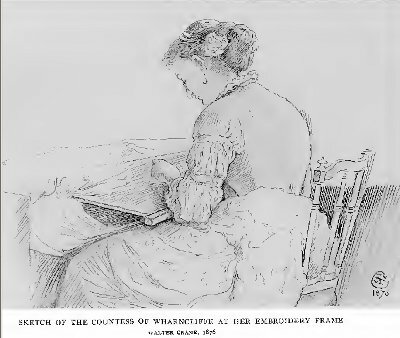 le miroir, les rubans et les dentelles pour les demoiselles, en haut au milieu. 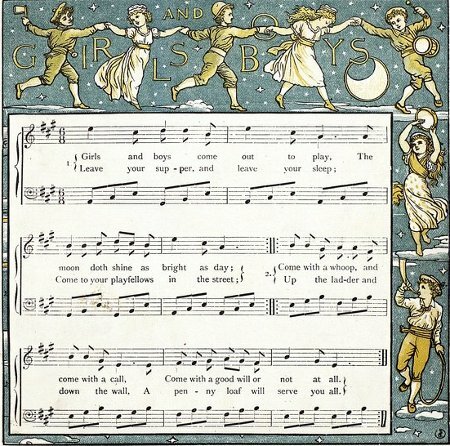 No doubt the combination of favourite nursery rhymes with pictures, as well as the music of the old airs, made it attractive, and commended it to mothers as well as children. 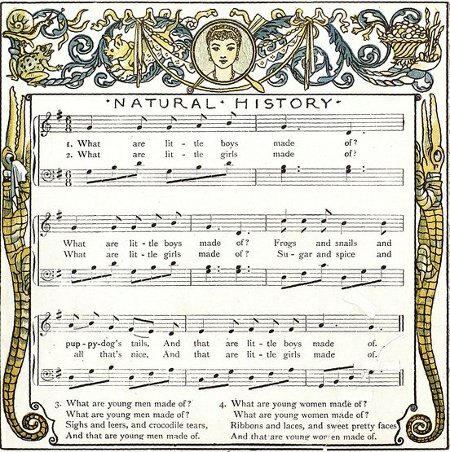 I was indebted to my sister for the arrangement of the tunes, which she collected with considerable care and research ; but she was a pianist of much taste and skill, and possessed a considerable knowledge of music, both ancient and modern, and the task was a congenial one, I feel sure. It was a book of the same size, and my sister again selected and arranged the musical accompaniment. 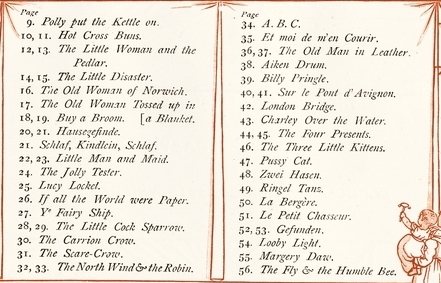 The rhymes and songs included one or two French and German ones. Le contraste entre le brun et le noir me semble particulièrement réussi pour la lecture de ces deux bandeaux. Dans le sommaire de ce deuxième album, l’on peut donc trouver "Zwei Hasen", "Ringel Tans", "Gefunden" ainsi que "Et moi de m’en courir", "Sur le pont d’Avignon", "La bergère" et "Le petit chasseur". The fourth sent a book that no man could read. And he had a little farm and little dairy O ! Which he often called his pretty little Fairy O ! Lifted up his little heels so very clever O ! And this only made the matter worse than ever O !